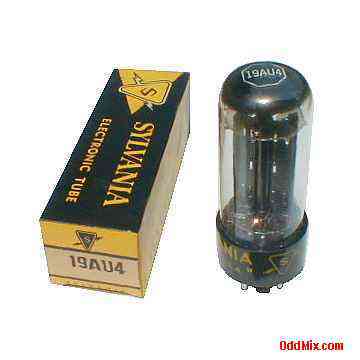 This is an original, vintage, no longer made Sylvania 19AU4 Half-Wave Rectifier electronic tube. These 8-pin octal tubes typically used as half wave rectifiers, dampers to provide multi kilovolt anode voltage for television (TV), photomultiplier and special purpose circuits. Useful for television or instrument restoration projects or to set up a private vacuum tube museum. It is a NOS tube - New Old Stock, unused, boxed, excellent condition.